Dunlap & Partners are a full-service engineering firm in Richmond, VA providing mechanical, electrical, plumbing, fire protection engineering design and commissioning services. Automatic Project management report generation and distribution. Project and time record data mining. Data mining for client invoicing. Time record policing, submission and approval. Employee benefit report generation and distribution. Compile information from Microsoft Access Databases. 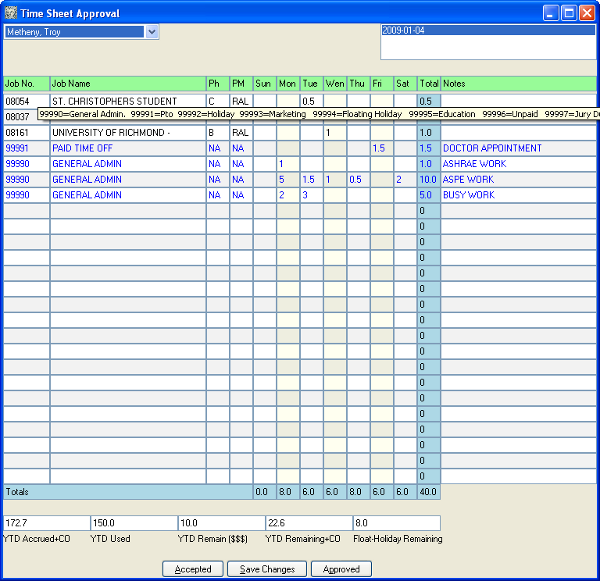 Automatically generate and distribute reports for use in weekly planning meetings. Police submissions of time records (screenshot below) and notify delinquent employees or management as necessary. Handle submission and approval of time record information. Track budget, resources, and project completion. Automatically generate and distribute employee benefit status reports. Copy and appropriately modify projects that are similar to previous projects, for use by staff. This reduces errors and decreases time worked on the project. Dunlap's Time Sheet Approval window. Dunlap & Partners chose Common Lisp on the advice of consultant William Proffitt, who has decades of experience with Visual/Autolisp. He identified rapid development and fast runtimes as key advantages Common Lisp would bring. CAPI, allowing GUI development for Microsoft Windows platform. No runtime royalties on software developed. Nice development IDE, especially the ability to change settings to Windows keystrokes over Emacs. Ability to compile to distributable standalone executable.